Estonia scored a real triple whammy at Torino 2006, taking home three medals, all gold and all in cross-country skiing. A result that saw the small Baltic state ranked second in the discipline just after Sweden but ahead of Russia and a bitterly disappointing Norway and Germany. The heroes of the moment were Kristina Smigun, who took gold in the combined and the 10 km classical interval start in the space of just four days, and Andrus Veerpalu, who took gold in the 15 km classical interval start, which he had already won in 2002. A Torino, nella 30 Km a tecnica libera, arrivò il primo oro Olimpico del fondo per la Repubblica Ceca. 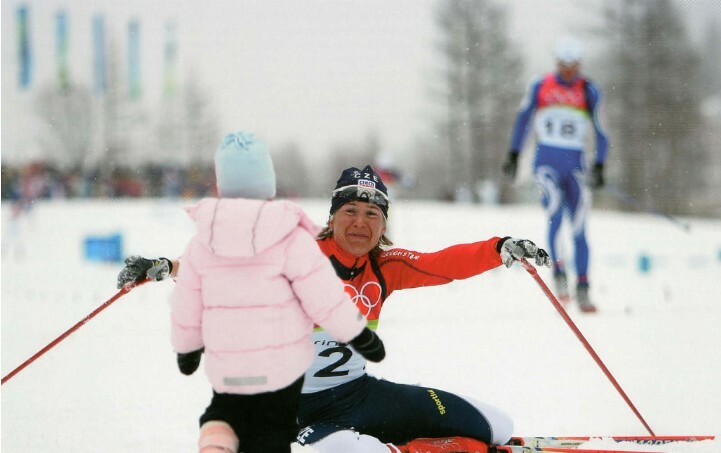 Una gioia speciale che Katerina Neumannovà ha festeggiato accogliendo fra le braccia la piccola Lucia proprio sul traguardo, in uno di quei fuori programma che diventano i ricordi più toccanti di un'Olimpiade. È il simbolo di uno sport associato soprattutto all'immagine di una fatica silenziosa, seminata nel silenzio dei boschi. Fatica che resta, pur con tutto il suo fascino, durissima. Ma che a volte si può cancellare in un attimo, per la gioia di portare al collo un oro. Anzi, due: la medaglia e la piccola Lucia (dal Rapporto Ufficiale del C.O.). Pochi puntavano sul successo della canadese Chandra Crawford nello sprint donne: nemmeno la ventiduenne di Canmore (Alberta), che diceva di ambire a un posto nelle prime trenta. Few could have predicted the success of Canadian Chandra Crawford in the women's sprint either. 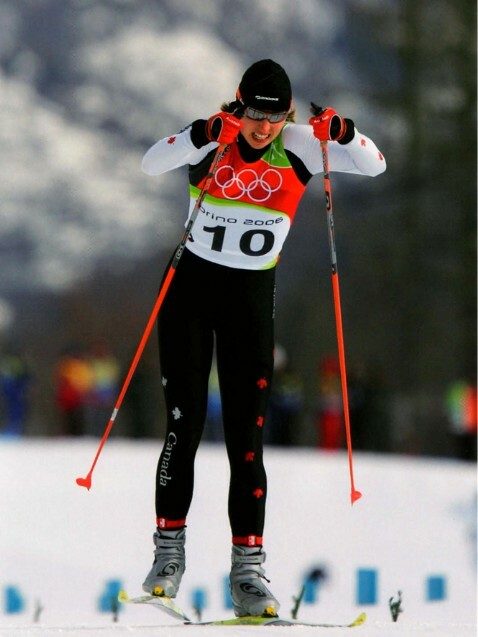 Even the modest 22-year-old from Canmore (Alberta) admitted that her ambition had been to finish in the top thirty. Russia was ranked third in the cross-country skiing medal count at the Torino 2006 Games. In terms of overall medal numbers (7), however, it was the real winner. 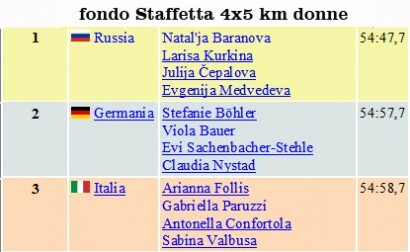 In addition to Dementiev's gold, the women's 4x5 km relay team (Natalia Baranova, Larisa Kurkina, Julija Tchepalova and, in the decisive fourth round, Evgenia Medvedeva) also beat Germany and Italy (Gabriella Paruzzi had five Olympic podiums to her credit) to win the gold medal.